Landing Page: where your all your visitors land. Opt-in Page: where your visitors convert into subscribers, buyers and/or users of the service you provide. The landing page and the opt-in page (in most cases) are usually the same page. Thank you page: visitors who convert are usually taken to a thank you page which will simply thank them for converting. 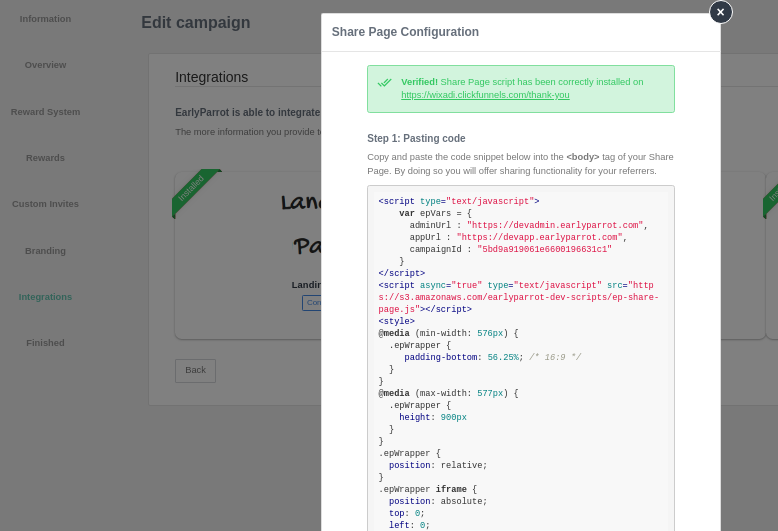 To integrate a referral campaign via EarlyParrot, you will need to add a script on the landing page. 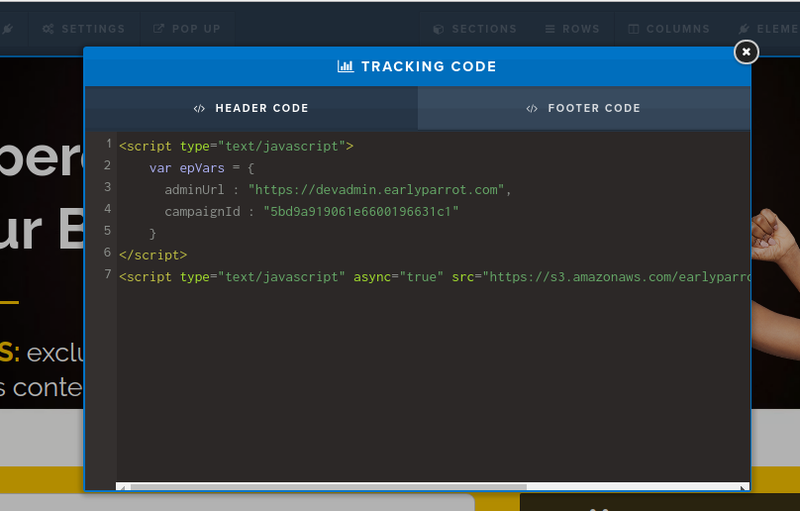 Through this script, EarlyParrot is able to track who is referring who and through which source referrals are coming from. 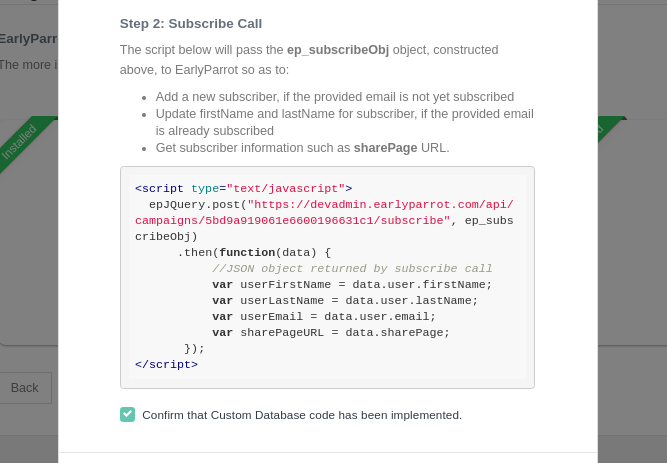 On the opt-in page, EarlyParrot needs to capture new subscribers to automatically add them to the referral campaign. This is done through a second script that needs to be installed on the opt-in page. This script is commonly called Subscribe API call. The third and final script that needs to be installed is usually added on the Thank you page. This script is called the Share Page script and it provides all the sharing functionality. Let’s go through each of the three steps in more detail. Once you have decided which Clickfunnels page will be your landing page, you must copy and paste the landing page script provided by EarlyParrot. 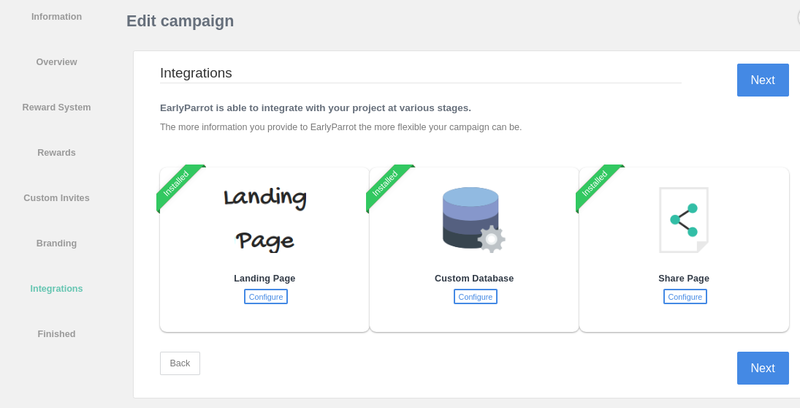 In the Integrations steps, in the create/edit campaign wizard, you will get to install the landing page. 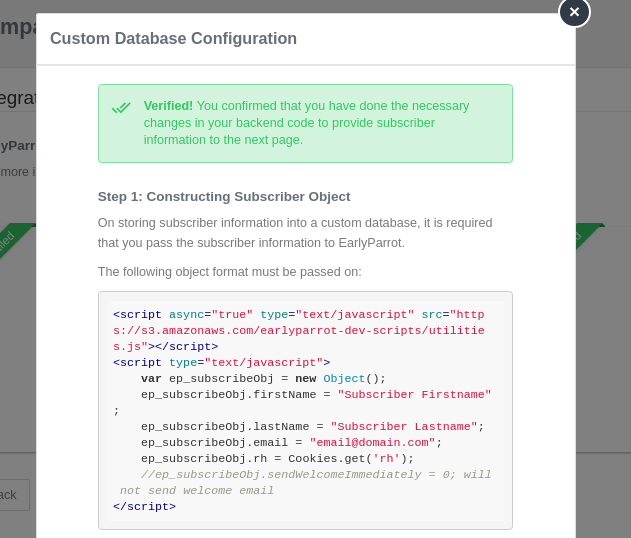 Click on the configure button under the Landing Page. 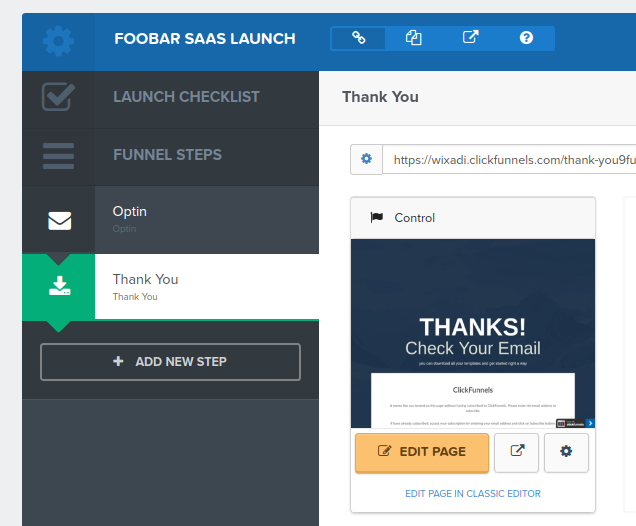 Copy the provided script and type in the URL of the landing page that you have created on your Clickfunnels account. 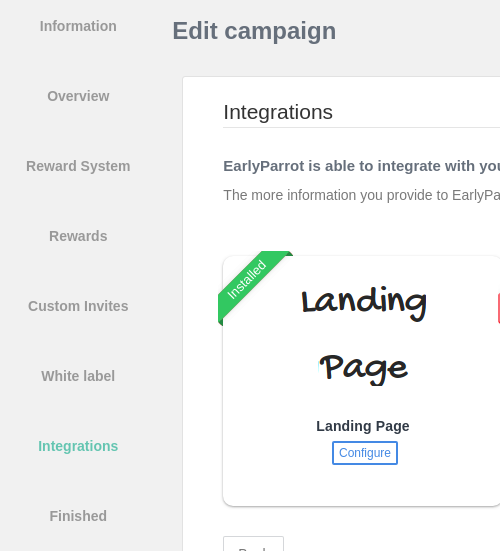 Via the provided script that you will paste on your Clickfunnels landing page, EarlyParrot will track all your referrals, who is referring who and where your referrals are coming from. 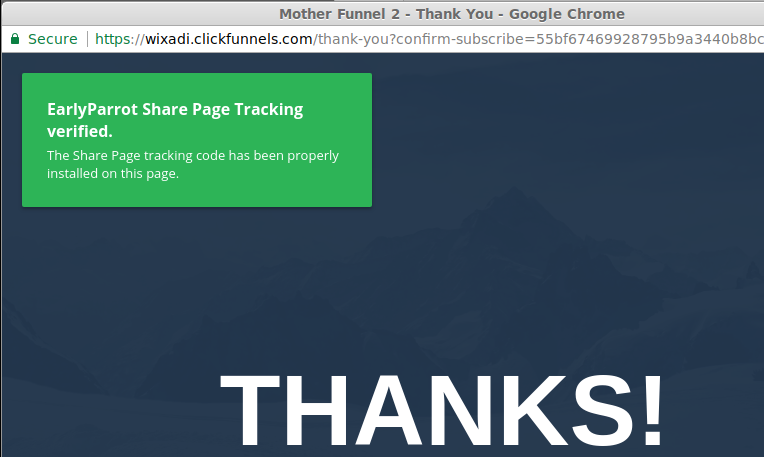 Installing a share page on a Clickfunnels page is very similar to installing a landing page. 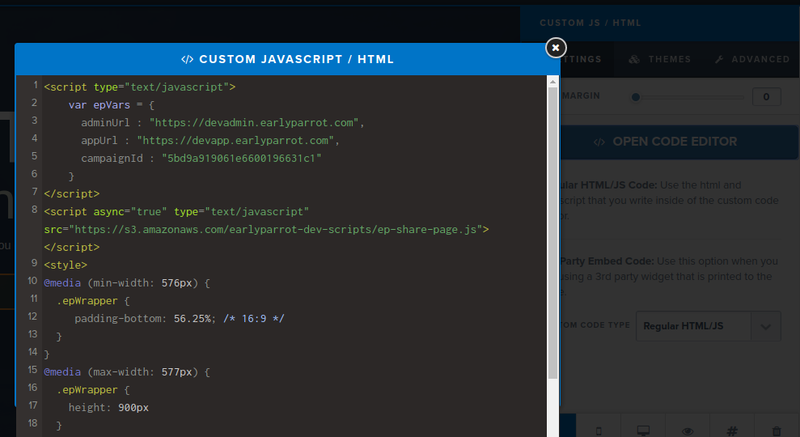 You will need to create a page where you will be pasting some code that EarlyParrot provides you with. 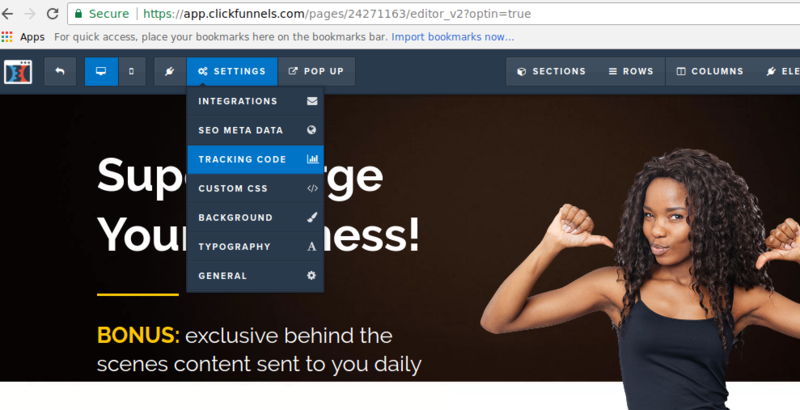 After you have created a new page in your Clickfunnels account that will be hosting your share page integration, copy the provided script and type in the URL of the share page that you have just created. 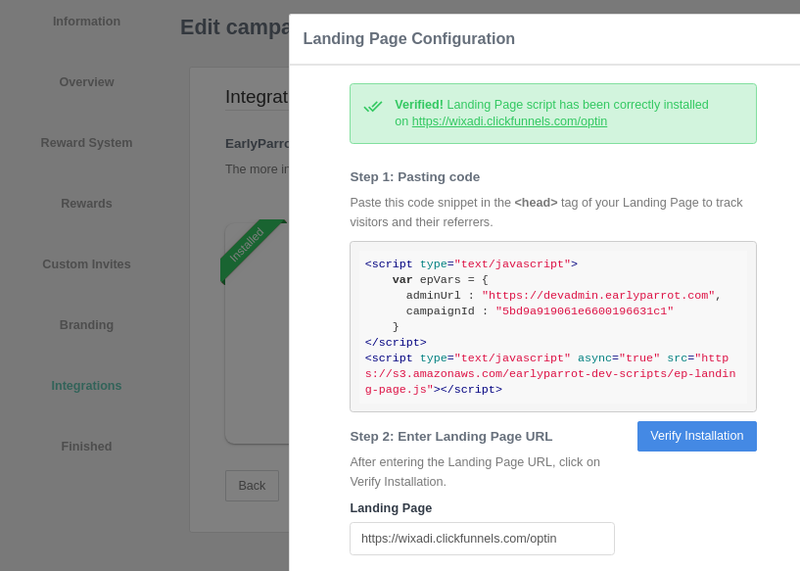 After saving and publishing your Clickfunnels page, click on the Verify Installation button to double check your share page script installation. Now that we have a way how to track referrals (via the landing page integration) and a way for referrers to share your campaign (via the share page integration), we need a way how to automatically add all subscribers who fill in the optin form to your referral campaign. This is done via the Custom Database script provided by EarlyParrot.